A college that was subject to an FE Week investigation has blocked this newspaper’s website from its internet servers – an action which has “absolutely shocked” the skills minister and “astonished” Ofsted’s chief inspector. FE Week revealed on Friday that Highbury College was locked in a £1.4 million legal battle with the Nigerian state. The story was fact-checked against the college’s own board minutes, accounts and evidence from whistleblowers. Highbury was provided with five working days to respond to our enquiries, but chose not to respond and provide their side of the story. It has since claimed to its staff through internal emails, seen by FE Week, that “much of” the story is “untrue” and “paints a picture of Highbury that we simply do not recognise”. The college has however been unable to tell FE Week specifically how the content of the story was inaccurate, even though they’ve had ample opportunity to do so. But in an unprecedented move, the college has attempted to suppress the investigation from its staff and students by blocking FE Week on its internal computer servers. 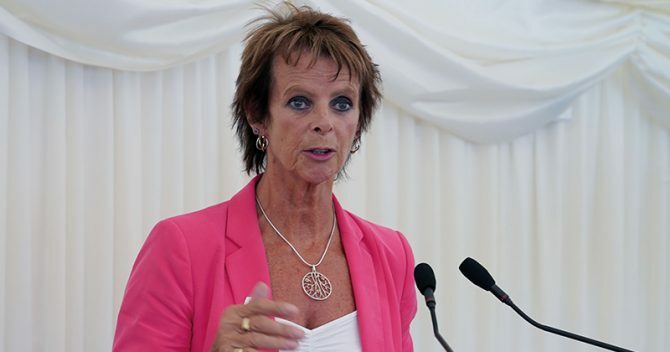 “That is terrible, absolutely shocking,” said skills minister Anne Milton when she learnt about the action. “In an organisation that is dealing with young people specifically, restricting access to staff or students or anybody is terrible. “I am shocked. The press has to be very careful because they leave themselves open to challenge so there are rules around ensuring the report is accurate. Ofsted’s chief inspector, Amanda Spielman, added that the move by Highbury “sounds astonishing and concerning”. Dominic Ponsford, the editor-in-chief at the Press Gazette, said he has “never heard of any organisation reacting in this way to negative press coverage, it may be a first”. “It seems like a staggeringly incompetent way to deal with negative press,” he added. A spokesperson for Highbury defended the decision. “It is college policy to block access to inappropriate websites,” she said. 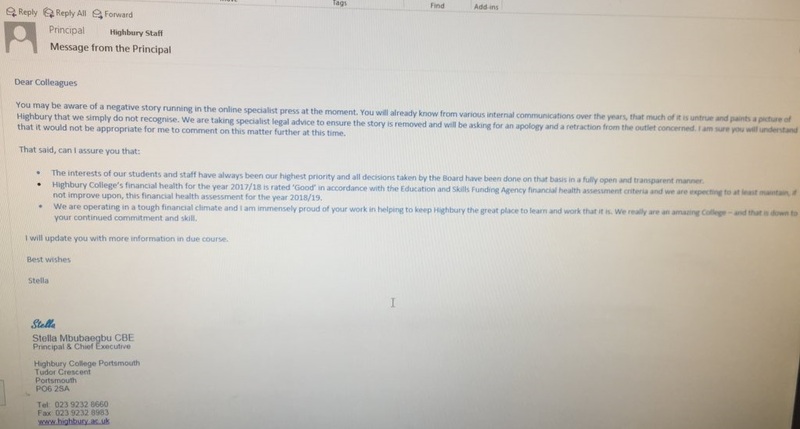 “In view of this we have blocked FE Week from the college’s internet servers because we do not think students and staff while in college, should be distracted by inaccurate and untrue stories about Highbury which may cause them concern or distress. This comes at the same time as FE Week continues to press the college to respond to a Freedom of Information request submitted last year. 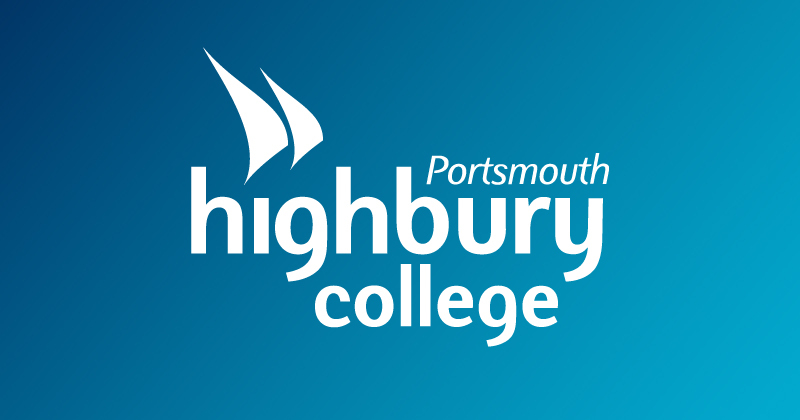 This newspaper requested the college’s corporate expense claims for the past five years 62 working days ago, but Highbury has chosen not to provide the information. This is despite FOI law stating responses should take no longer than 20 working days, or 40 working days if the organisation needs to apply the public interest test. FE Week has now taken the decision to report the college to the Information Commissioner’s Office for their failure to comply with the Freedom of Information Act. From a previous FOI, it was revealed that Highbury’s principal, Stella Mbubaegbu, used college cash to pay for a first-class return flight from London to Dallas at a cost of £4,132. The college has refused to say whether or not this flight was work related. When institutions/individuals face the constant tirade of inaccurate, incomplete and unbalanced reportage, which is perpetuated by the system, they have to resort to self-protection. When this is further exacerbated by the lack of support from the so-called ‘guardians’ of the sector, it is valid for colleges to remove patronage from sensationalist, vindictive and crass journalism. Only by understanding the pressure placed on people unfairly….can we note such hypocrisy from FE Week. If you comply with the request, there is no problem. You are creating the problem by not complying which leads people to believe there is something not quite right and perhaps, the college has something to hide. It also leads the general public to believe that it is a possibility that the college are buying time in an attempt to cover something up. By the way, who pays over £4k for a flight to Dallas? What an appalling way to spend funds! Totally shocking and inexcusable. The government should get involved here and have all the servers imaged and examined. As there are absolutely no specifics in either your response or the college’s to the FE Week stories, it appears the only person making unsubstantiated or unfounded allegations is you. College leaders should be held accountable for their behaviour, decisions and performance, as should other staff. The difference is that when leadership fails, the fallout is much greater. It seems to me that FE week is filling a void that exists through ineffective scrutiny by Gov & conspicuous lack of self governance by sector bodies and leadership. Well done to FE week for publishing this story, and indeed, the response from Mr Basi. 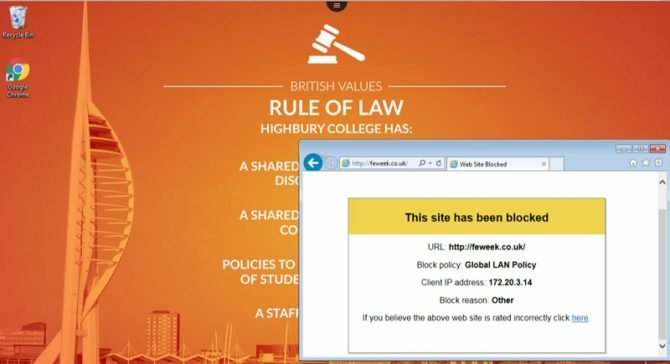 In an era of attacks on press freedom, censorship and terrible violence towards journalists, the actions of Highbury College really are ‘shocking’ (although not surprising). The fact that Mr Basi has responded in the way he has is also not a surprise. We know that too many CEOs treat their colleges as their own personal feifdoms and waste public finances on vanity projects, schemes and 1st class flights. I’m sure Mr Basi appreciates that FE is neglected by mainstream media, and so the actions of highly paid senior managers would escape scrutiny if it weren’t for a publication such as FE week. It is also interesting that Mr Basi uses the term ‘inaccurate’. The previous commenter has a point about ‘libel’. His Linkdin profile states that he took NCN from being a ‘mediocre college to the onset of a merger’. History will record that Mr Basi took NCN from a ‘Good’ college to one that ‘Requires improvement’. His final statement truly highlights why FE week must continue to challenge, critique and expose financial and other abuses in the sector – ‘only by understanding the pressure placed on people unfairly …’ says the man whose mantra was ‘accountability downwards’. Well said, you got in before me! I find it amusing that in the background of the screenshot of the blocked site they have their British values materials.